So when I say “shake up” your morning, I mean change it…for the better! 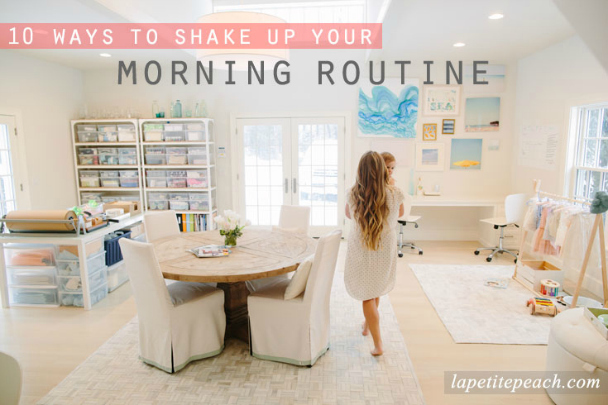 The point is to have a routine of any type, in the morning or at night. You need, and deserve, REAL time to yourself doing things that will make your day better and easier. 1. Wake up an Hour Earlier: This is like probably the last thing you want to do, but I PROMISE it will start a cycle of productivity! Once you start getting up an hour earlier, you will be tired earlier. This means more sleep. 2. Change What You Eat: Before you go to bed at night, place a glass of water with lemon beside your bed. Don’t get out of bed in the morning until you drink the entire glass. It is SO good for your body, flush out all those toxins before your feet hit the floor. Follow that with a multivitamin, a smoothie (or oatmeal) and finally your coffee or tea. You will get the best energy all day long. 3. Yoga: Before you get out of bed, do some stretching. Stretch your arms above your head with your fingers interlocked. Then stretch them in front of you and lean forward. Lay on your back with your feet stretched in the air. Do whatever moves you want to get the blood circulating. You will feel more awake in just a few seconds. 4. Take 5 Deep Breaths: Before you step out of bed, take five large, very big deep breaths in through your nose, and out your mouth. This always puts me at ease. 5. Change Your Sheets: Then spray them with a lavender spray (like this one) so when you climb into bed tonight they will be clean, crisp, and smelling like sweet slumber. Of course you don’t have to do this every day (not realistic), but try it on the first day of your new morning routine. 6. Repeat This Mantra: Say three times “I am going to kill it today. I am going to do my very best, at every single thing I do.” Say whatever mantra you want, but say it out loud and believe it! 7. Make Big Decisions in the Morning: This is when you are most clear. Don’t save decisions for the end of the day. Also, make a list of things you need to do for the day in the morning so you aren’t doing it on the fly and stressing yourself out. 8. Switch up your Coffee Routine: This is literally a killer for me personally because I love coffee. However, alternating coffee days with tea days, will change your life. Mondays are most definitely a coffee day but try to drink tea on Tuesday/Thursdays. I have noticed that coffee dries out my skin, and I think switching it up has seriously helped. 10. Go to Bed an Hour Earlier: Get into bed an hour earlier. You don’t have to go right to sleep, but do something calming. Read a book or a magazine, but be technology free. NO emails, Instagram or Facebooking. Do something for you! Put on a face mask if you don’t like to read! Try these out, and tell me in the comment section how you feel! Looks you are right on track! That’s my office…it used to be my stinky old garage…crazy right? !